If that analogy doesn’t already paint a bleak enough picture, addressing Customer Success at high-growth SaaS startups only makes things more challenging. If Customer Success at enterprise companies (i.e. annual contracts of $100K+) is a black-tie affair with an exclusive invite list, then Customer Success at the typical SaaS startup with an ARPU around $100 is a frat party with an open door policy. In other words, things can get out-of-hand fast. Someone put a shirt on that customer! Ok, I’ve milked this party analogy for all it’s worth (and then some) - what’s the solution? Well hypothetical reader, the answer is to build your startup with Customer Success in mind from day 1. Now, I’m not suggesting you hire a CSM as your 3rd team member. But, you should put a framework in place early-on to tackle CS as a team in a responsible, organized manner. And naturally, the best place to start in addressing Customer Success is with your product. 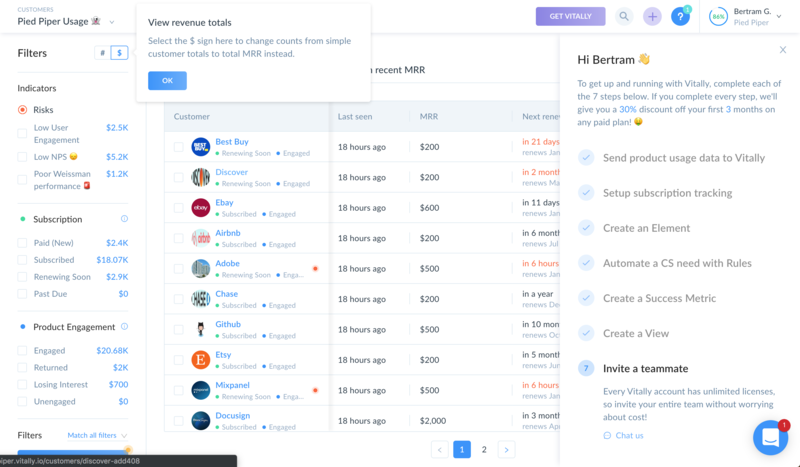 High-growth SaaS startups can see thousands of accounts come and go in a month. Naturally, you can’t personally onboard that many customers, which means you need a strategy in place to ensure customers can be successful with your product without much hand-holding from your team. In part 1 of our inaugural series, we’ll go over several bases to cover + tools to use that together increase the chances of seeing customers successfully use your product. 🤘Do: Create a help/resource center from day 1. For every new feature or integration you ship, make sure it has an article in your resource center documenting 1) what the feature does and 2) how to use it. 🙅Don't: Delay documentation in favor of shipping earlier. You’ll only end up procrastinating and eventually let documentation fall far behind. 🤘Do: Add a link to that article wherever your users can use that feature in your product. When your users encounter some feature in your product, they shouldn’t have to hunt for documentation on how to use it. 🤘Do: Create GIFs showing how to use the feature. Embed these GIFs in the help article, emails, blog posts, etc. 🤘Do: Have engineers that develop the feature also write the documentation. They may kick and scream initially, but the sooner it becomes a standard practice, the more they’ll learn to love it. RecordIt & Cleanshot - capture your screen as a GIF and manage your screenshots with ease. A GIF really is worth a thousand words when documenting how to use your product. Getting everything setup by the first user(s). This often entails setting up an integration or two, creating some data, etc. Checklists are your friend here - give the user clear insight into the steps required to get fully setup + their progress in that list. Getting future users onboarded. For B2B products, from the second user on at a customer, you often need a different onboarding experience that leverages the work done by the initial user(s). Checklists can work here depending on your product, but we’re fans of ‘hotspots’ - in-app callouts that highlight important features/actions the user can take. Show the user what the end result of their work will be. This is often done with fake data (i.e. injecting sample data in place of data the user needs to create) and live demos. We do the latter. Gamify the onboarding process and give the user discounts or credits to complete the needed steps. Google does this with Adwords, as we received a $100 credit by setting up conversion tracking on some ads we recently launched. Apollo.io is another example, as you can extend free usage of their prospecting product for a good while by following their onboarding process. 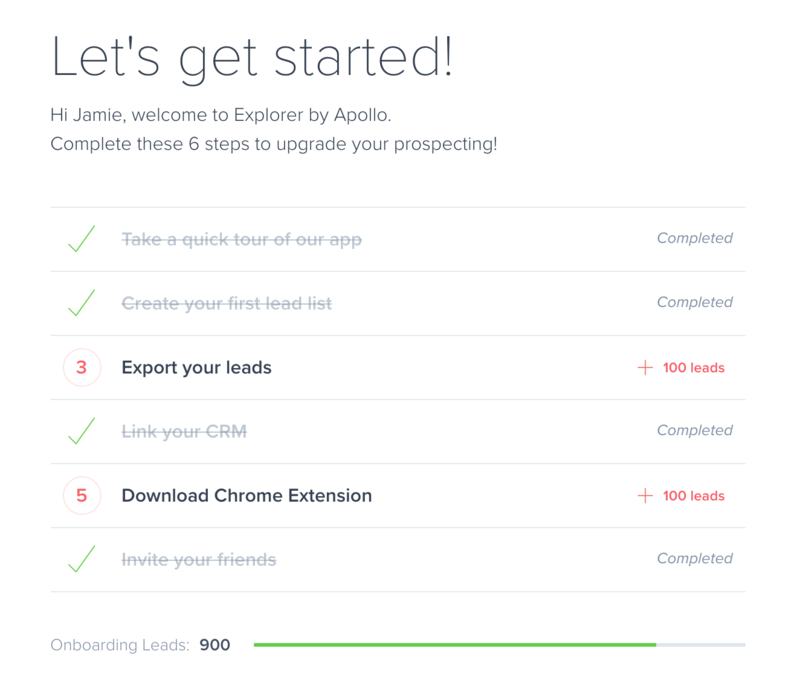 Apollo.io’s onboarding process helps you setup their product while earning a lot of free leads! 🤘Do: Provide easy access to extended help articles alongside ways to contact your team. Again, don’t make your users hunt for your support docs or contact info. During onboarding is when they’ll most need it. 🙅Don't: Rely primarily on documentation. Show me more than just a bunch of text - get creative and at least give me some pretty pictures. 🤘Do: Keep it as short as possible. Less is more - figure out the minimal actions needed to get the product setup, and then let the user explore. If need be, pivot from a guided checklist to in-app hotspots once the product is ready to use. 🙅Don't: Add unnecessary steps that users have no incentive to do yet. A common example here is asking the user to invite their team. Yes, it should be easy for the user to do that. Should it be shoved in their face before they’ve even fully experienced your product? Probably not. With apologies to all the startups that sell onboarding tools like hotspots and guided tours, we are fans of building this yourself. It really isn’t all that hard to do, and having complete control over this opens the doors to endless creative possibilities. Customer feedback - For each feature/change in your roadmap, keep track of the customers/leads that expressed interest in that item. Once you ship the feature, reach back out to that list to increase adoption of the feature and drive more sales. Team feedback - Increase transparency and team unity by ensuring your roadmap is visible to, and can be discussed by, your entire team. 🙅Don't: Let customers hijack your roadmap. 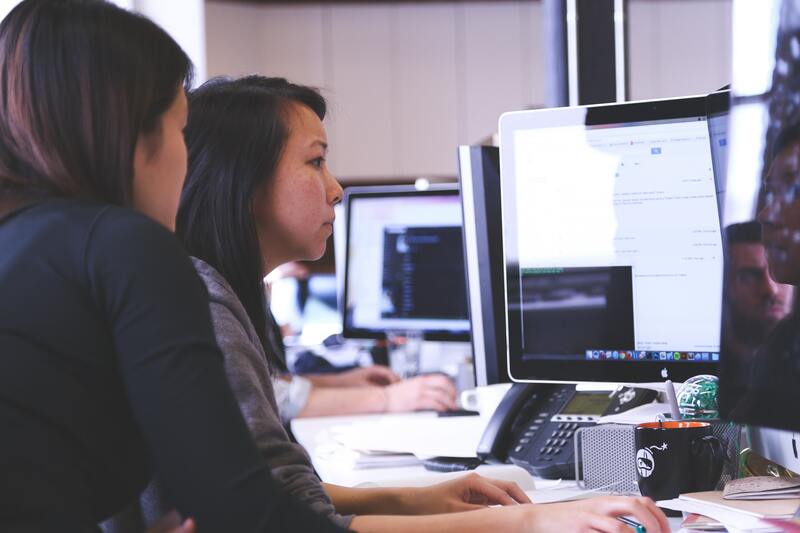 Customer feedback is wildly important, but there’s a balance to be achieved between iterating on customer feedback and simply doing what customers ask. I’m a pretty firm believer that the most successful startups are creating things more ‘inspired’ by their customers than exactly asked for, so be sure to avoid letting your customers hijack your roadmap - and thus your vision and company - by only doing the things they specifically ask for. 🙅Don't: Treat your roadmap as a basic to-do list. As you acquire more customers and receive more feature requests, you’ll need some process of ‘scoring’ the applicability of those requests to your larger goals and vision. If you are simply tacking on new requests at the bottom of what is essentially a basic to-do list, it’ll be almost impossible to ensure you are iterating towards your larger vision and goals. 🤘Do: Send (at least) monthly updates. 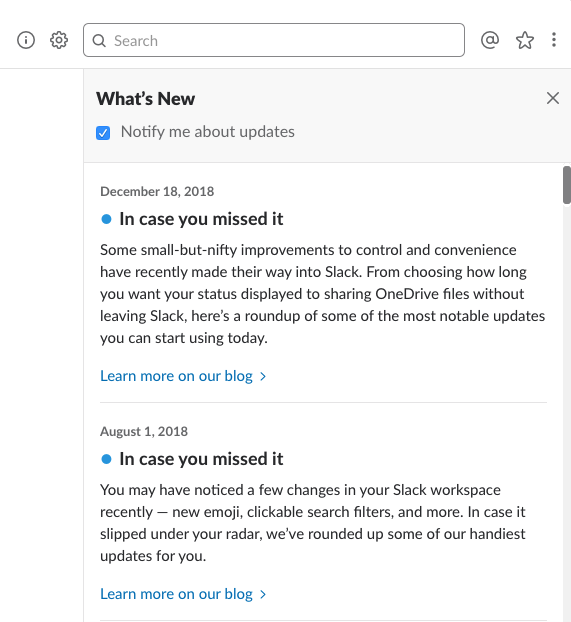 Even if you didn’t ship something huge, sending monthly updates at least reminds your customers that you exist and are working on the product. Write a new blog post that showcases the value/impact of your new release. Write a help doc in your resource center that documents exactly how to leverage the new feature. Send an email that concisely lists each new feature and links to the blog post and resource center for customers to dig in more. 🤘Do: Make it easy for customers to preview new features and get personal guidance from your team. Customers shouldn’t be required to setup your new feature in order to see its value, so provide links to live demos or attach GIFs/videos. 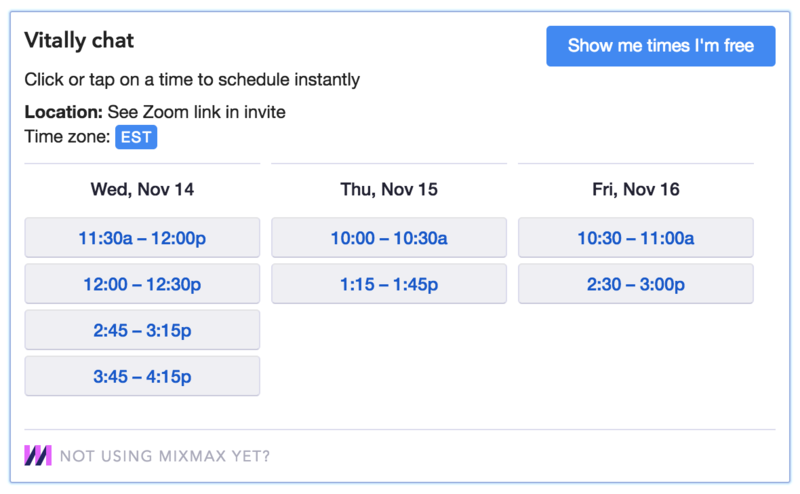 Then, for customers who’d like to learn more about the new release, make it easy to for them to get a personalized demo by attaching your calendar at the bottom of the release email. Productboard. They absolutely nail the ability to create a roadmap that balances customer feedback with your overall goals and vision. You can easily track customer feedback on specific roadmap items and even calculate a weighted score for each item’s relevancy to a larger goal. We use it and absolutely love it! Intercom. Ok, to be honest, I don’t love it - their admin capabilities can be super buggy (sorry Intercom, but if I delete a user/lead, I shouldn’t have to wait 10+ minutes while your cache expires). But, sending messages to our customers about product updates is pretty easy with it. So, it’s got that going for it…. Mixmax. It’s hard to put what Mixmax does into words, as there’s…a lot there. But, their ability to easily share your calendar with customers (via both a link as well as embedded into emails) works much better than competitive offerings. Contentful: Already mentioned earlier, but another awesome use case for Contentful here is to 1) write your product update posts in Contentful and 2) add the ability for users to easily view your most recent updates from within your product using their API! 🤘Do: Track product usage from day 1. You can’t improve what you don’t measure, so have engineering implement a product tracking tool from day 1. 🙅Don't: Rely on out-of-the-box, overly simple tracking scripts like Google Analytics. I’m not trying to throw shade at GA here - it’s got its time and place. However, I don’t think that time is building a B2B startup and that place should be your primary product - it just wasn’t built for that use case. To build a truly successful B2B product/company, you’ll most likely need to have your engineers implement a solution that’s deeply embedded into your product. There’s no magical “just embed this script in your HTML” solution to help you out here. 🤘Do: Keep your product tracking solution up-to-date. 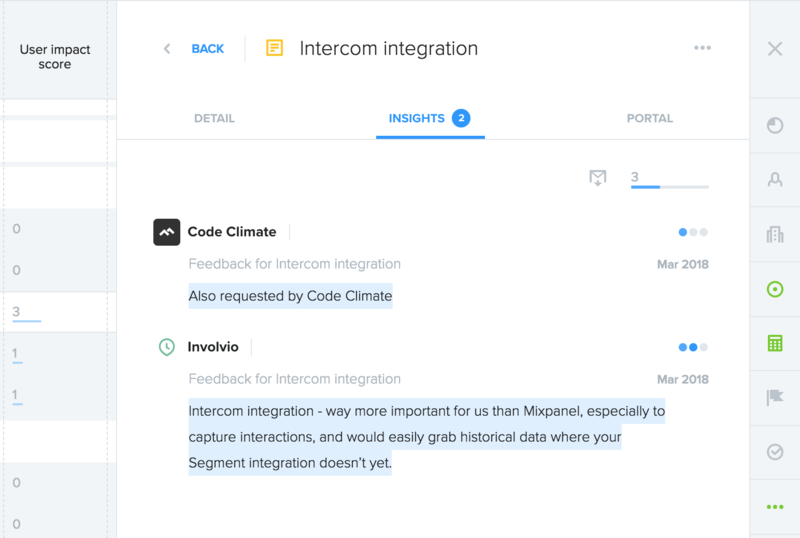 As your engineers build new features and integrations, tracking usage of those enhancements should be part of their development cycle. PRs should be rejected if the only way to understand whether product changes made are actually used is with a SQL query. 🙅Don't: Let your tracking efforts fall behind. Many teams will implement a tool like Segment, only to launch change after change that doesn’t leverage it. This leads to a messy setup, where some things are tracked in Segment, while some require manual SQL queries. Chaos ensues, and everyone gets frustrated because they don’t know where to look for the data they need. Avoid that chaos - create a process where tracking is a requirement and not a nice-to-have. 🤘Do: Measure product usage at the user and account level. B2B startups have 2 layers of product usage - one at the user level (i.e. how does each individual user use your product) and another at the organization level (i.e. how is the product implemented by the organization). Your product tracking implementation and tools need to account for both these levels in order to ensure customer success. Besides our own product 😉, we mostly rely on Segment here since it gives us a single tracking API plus the ability to push our data to any tool. Well, that’s it for part one in our series focused on helping high-growth B2B SaaS startups tackle Customer Success. Check back later for part 2, which will focus on measuring the success of your product, business, and customers. Until next time!